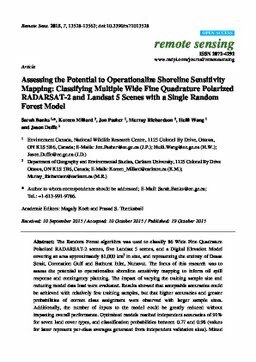 The Random Forest algorithm was used to classify 86 Wide Fine Quadrature Polarized RADARSAT-2 scenes, five Landsat 5 scenes, and a Digital Elevation Model covering an area approximately 81,000 km2 in size, and representing the entirety of Dease Strait, Coronation Gulf and Bathurst Inlet, Nunavut. The focus of this research was to assess the potential to operationalize shoreline sensitivity mapping to inform oil spill response and contingency planning. The impact of varying the training sample size and reducing model data load were evaluated. Results showed that acceptable accuracies could be achieved with relatively few training samples, but that higher accuracies and greater probabilities of correct class assignment were observed with larger sample sizes. Additionally, the number of inputs to the model could be greatly reduced without impacting overall performance. Optimized models reached independent accuracies of 91% for seven land cover types, and classification probabilities between 0.77 and 0.98 (values for latter represent per-class averages generated from independent validation sites). Mixed results were observed when assessing the potential for remote predictive mapping by simulating transferability of the model to scenes without training data.